The overall emotion regulation network contains the orbitofrontal cortex (OFC) ventromedial prefrontal (VM PFC) regions including the anterior cingulate cortex, amygdala and the striatum as well as the insular cortex and the hippocampus. Studies show increased activity in motor areas of the brain during emotional processing (), suggest the emotion-action interface may involve connections between the amygdala and the anterior cingulate cortex (ACC). OFC activity overrides emotional responses, apparently by providing information and a bias toward long-term, goal-directed behavior. The experience of intense emotion, and its accompanying potential actions, can often be inconsistent with one’s long-term goals. The OFC, particularly the left VM PFC, provides a biasing signal to avoid immediate reward, and thus maintain one’s pursuit of one’s longer-term goals: with healthy left VMPFC functioning, one gains access to the emotion associated with anticipated outcomes consistent with one’s long-term goals. Activation of the left VM PFC also inhibits amygdalar activity (Davidson, 1998), thus shortening the time course of the experience of negative affect and attention to stressful stimuli. Damage to the OFC, and damage specifically to the VM PFC, may result in affective lability and rash action particularly in inhibiting the action of amygdaloid reactivity. This impairment of vmPFC may be a factor in pre-morbid vulnerability. One study, demonstrated relatively increased cerebral blood flow (CBF) in bilateral amygdala and vmPFC and relatively decreased CBF in bilateral insula, right dorsal anterior cingulate cortex (ACC) in high-risk adolescents for an alcohol use disorder (AUD). The insula and ACC interaction is important to emotional processing ( ), so at risk adolescents may have a reduced ability to label and process emotions combined with a tendency to recruit more subcortical regions in emotional responding. This impairment of the vmPFC is also seen in alcoholics ( ) with significant differences in responses to stress and relaxation-inducing stimuli between alcoholics and healthy controls. The vmPFC/ACC activity during the neutral-relaxed state was significantly higher than the response in controls. Given its crucial role in emotion regulation, heightened vmPFC activity during neutral-relaxing states may disrupt effective reward and stress regulation. Recovering AD patients showed hyperactivity in the vmPFC/ACC during neutral-relaxed trials, but hypoactive responses to stress and alcohol cue exposure. This hypo-active vmPFC/ACC during emotional challenge has been associated with affect dysregulation (45) and decision-making problems in substance-abusing patients. Under stress conditions, in cocaine addicts, show a hypactivation in the ACC and recruit more emotive-motoric regions instead of the dorsal striatum which implicates a chronic stress and emotion dysregulation. In alexithymia, dysfunction of the ACC has also been frequently argued, e.g., , while other researchers have focused on neural substrates, such as the amygdala, insula, and OFC ). These areas also map onto the brain region morphological vulnerability mentioned as being prevalent in those with substance addiction (and in those with later vulnerability). Magnetic resonance imaging and post-mortem neuropathological studies of alcoholics indicate the greatest cortical loss in the frontal lobes, concurrent thinning of the corpus callosum, damage to the amygdala and hippocampus, as well as in the white matter of the cerebellum as well as the ACC and insula. All critical areas of alcoholism-related brain damage are important for normal emotional functioning (14). Another neuroimaging study (19) compared various models of alexithymia and showed people with alexithymia showed reduced activation in the dorsal ACC and right anterior insula (AI), and suggested individuals who exhibit impaired recognition of their own emotional states may be due to a dysfunction of the ACC-AI network. When alexithymics perform the IGT, they fail to learn an advantageous decision-making strategy and show reduced activity in the medial prefrontal cortex, a key area for successful performance of the IGT, and increased activity in the caudate nucleus, a region associated with impulsive choice (20). 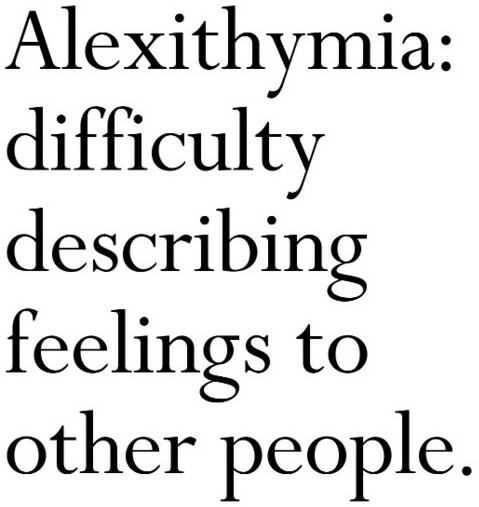 The neural machinery in alexithymia is therefore activated more on the physiologic, motor-expressive level. A similar finding was shown in a study on children of alcoholics. This study demonstrated that those at risk also used more motor expressive regions to carry out the most basic cognitive tasks. In vulnerable adolescents there was activation of the ACC along with caudate nucleus which suggest an attempted inhibiting of impulsive responses during the most basic behavioural tasks. Nonetheless it also illustrates an inclination towards impulsive based decision making. It is tempting to speculate that this ability to inhibit is inceasingly reduced by escalating and stress and emotion disregulation in the addiction cycle as brain region is implicated in this regulation. This would lead to the dysregualtion of control under emotional distress as in patients with cocaine dependence who also have with higher alexithymia scores compared with healthy control subjects (21. These patients also failed to activate the anterior cingulate during stress imagery, (22). Again these cocaine-dependent patients demonstrated greater activation in the dorsal striatum, a region implicated in reward processing and obsessive–compulsive behaviours. 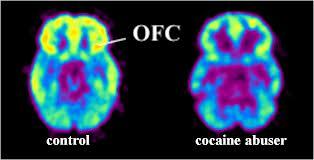 This neural transition from hyper to hypoactivity of the ACC may be a neural of addiction severity. In premorbidity there may be inherent to decision making, a greater effort required in at risk adolescents in inhibiting response. We posit this is due in part to difficulties in emotion processing whereby emotion does not guide goal directed behaviour – in fact undifferentiated emotion expressed as a distressing experience predicts that effort will instead be directed to the immediate, unavoidable goal of alleviating this unpleasant experience. As suggested earlier, this emotional dysregulation can prompt a desire to “ feel better” and the use of addictive behaviours to regulate emotions which are manifest as negative emotions. Hence a cycle of behaviour may be set in motion. This emotion dysregulation in potentiating reward networks may make these individuals feel better and reinforce this behaviour in regulating negative emotion. Instead of adaptively regulating this negative emotion, they may impulsively choose to feel better and “regulate” negative emotions in a manner that will be increasingly maladaptive. Certain individuals who have this difficulty with regulating emotions may begin regulating them in more external, but ultimately self destructive ways. This seeming positive reinforcement (if it is ever purely positive, as it is in response to negative affect and not purely reward based) soon becomes increasingly negatively reinforcing in the abusing phase of the addiction cycle. Ultimately this distress is experienced so keenly and chronically that it begins act as a stimulus to the responding of compulsive behaviours. Whatever diminished emotion regulation existed in premorbidity, becomes so depleted that regulation of emotional distress is governed by unconscious processes of compulsive responding. In terms of a neural mechanistic link between premorbidity (in terms of addictive behaviour at least) the ACC already overtaxed and deficient in recruiting the prefrontal cortex in these individuals progresses from a hyperactivity to a hypoactivity and in doing so more immediately recruits the areas of the dorsal striatum implicated in compulsive behaviour. The metaphoric “line that is crossed” from abuse to addiction may do so at the ACC. This increasingly reduced role of the PFC, especially the VM PFC and OFC in regulating amgydaloid activity may prompt a more emotional reactive profile in decision making and progress distress based impulsivity to endpoint compulsivity, akin to the emotional arousal habit bias we posited in our earlier model in which heightened amgydaloid activity recruits the dorsal striatum in controlling behaviour.